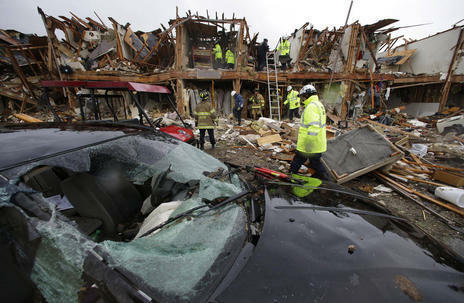 The bodies of 12 people have been recovered after an enormous Texas fertilizer plant explosion that demolished surrounding neighborhoods for blocks and left about 200 other people injured, authorities said Friday. Texas Department of Public Safety Sgt. Jason Reyes said it was "with a heavy heart" that he confirmed 12 bodies had been pulled from the area of the plant explosion in West, about 20 miles north of Waco.